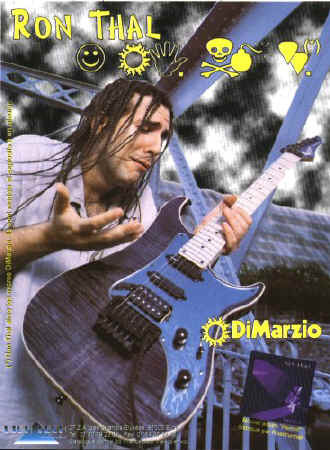 On my first French tour in February '97, the people at Vigier guitars came to a show and gave me a guitar to try. I did the show with the guitar and it played great. When I returned in May, we had dinner and threw ideas around. I told them how I had always built my own guitars, and we should come up with something special - something to replace the Swiss Cheese guitar as my main guitar. We signed an endorsement agreement and began planning the Bumblefoot guitar. Vigier gave me an Excalibur guitar to take home. When I was recording the first version of Uncool in 1999, I bought a Roland guitar synth and installed the pickup onto this guitar, and used it on the Uncool tours in 2001.